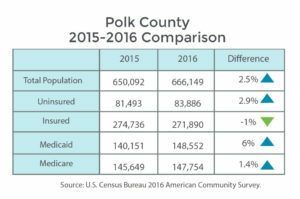 There are 83, 886 individuals in Polk County who do not have health insurance*; that’s nearly 10% of our total population. 72,499 of these individuals are adults between the ages of 18 and 64. They are parents, artists, servers, and health care workers. They are students, self-employed entrepreneurs, lawn care technicians, and more! LVIM exists to fill the gap in healthcare coverage for those who are working and uninsured. Our patients do not qualify for government assistance, but cannot afford the price tag of high cost health insurance premiums. Whether the company they work for doesn’t offer insurance or their family can’t afford what insurance is offered, families are left with nothing and no backup plan for when things go wrong. Without assistance, families rely on the emergency room as their healthcare provider, the bills rack up, often resulting in personal bankruptcy. Or, worse, these individuals are caught with few resources and often feel they have no choice but to let chronic illnesses go untreated, often resulting in worse outcomes than if treatment had been available. That’s where Lakeland Volunteers in Medicine steps in. 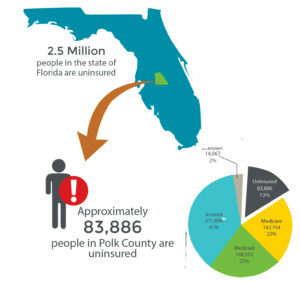 LVIM provides FREE, primary medical, dental and mental health care to those who are working and uninsured in Polk County, FL. have been served at Lakeland Volunteers in Medicine. have been provided by LVIM! filled for our patients at LVIM. conducted by our LVIM team. Through the Pharmacy Program, LVIM improves the health and well-being of patients. The majority of LVIM’s patients have chronic or multiple chronic conditions that require multiple patient visits as well as multiple prescriptions and if not properly treated complications can lead to hospitalization or event death. LVIM’s pharmacy carries an array of generic medications and does not deal in any narcotics whatsoever. Additionally, LVIM coordinates prescription assistance through major pharmaceutical companies in order to meet the need of patients who require name-brand drugs or in cases where there is not a generic option. 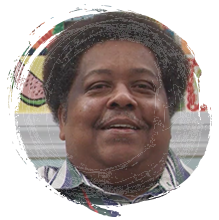 LVIM’s pharmacy program helps patients get well and stay well so they can get back to what is important to them – living life. • Referrals to endodontists, periodontists, and oral surgeons as needed. At LVIM, when a patient is diagnosed with a chronic disease, the patient is referred to a chronic disease clinician and an initial evaluation is performed with the patient. This evaluation includes medical history, lifestyle choices, baseline testing, personal goals and clinician goals. From there, a plan of action is developed, implemented and monitored. At LVIM the most prevalent chronic diseases are diabetes, obesity, hypertension and high cholesterol. In 2017, LVIM implemented specific progress monitoring measures to ensure that the healthcare LVIM provides is making a measurable difference for our patients. Patients at Lakeland Volunteers In Medicine (LVIM) receive recommended annual health screenings as outlined by the United States Preventative Services Task Force, ensuring that those who are diagnosed with cancer, chronic diseases, or other potentially lethal illnesses are able to access the treatments needed to get well and stay well. This helps patients avoid trips to the ER that often result in expensive care that becomes burdensome on both families and the hospital that cannot recoup the cost. Are you a Polk County resident? Are you employed or a full-time student? If you answered YES to these four questions, we’d love to welcome you to the LVIM Circle of Caring! 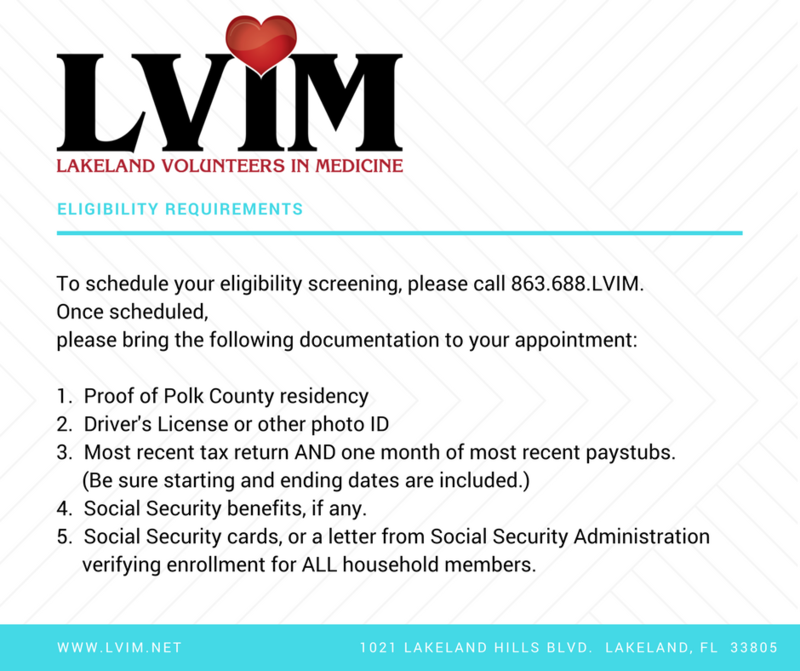 Please call 863.688.LVIM (x104 or x105) to schedule your eligibility screening today! of the LVIM mission and the ‘culture of caring’ here at LVIM. Amanda Cooper with her healthy & happy children. Terry Schmelzer will see her daughter graduate. Bonnie Carter is a singer, a musician, a self-professed computer nerd and a graduate of Southeastern University. She is a pastor’s wife, a teacher of music and technology and a manager. Bonnie has had a good, full and happy life. Five years ago, her family’s happiness was interrupted when her husband received a colon cancer diagnosis. Mr. and Mrs. Carter’s whole world came to a screeching halt; their happy life was replaced with doctors and hospitals and extended pain and suffering. While traveling the horrific world of cancer with her husband, Bonnie developed neuropathy in her hands due to overuse and chronic diabetes. Bonnie’s neuropathy worsened quickly and became an impairment so much so that it was classified as a disability and she was unable to work anymore. During this time, she stayed home to care for her husband and his fading health. And, after two-years, Bonnie’s husband lost his battle. The diagnosis had been so unexpected and they were so young. They had not yet made any preparations for their future. In the wake of his death, Bonnie was left with a pile of medical bills and a mortgage she couldn’t pay. She lost her home, her health insurance, and everything she owned. Feeling alone and desperate, she moved to Lakeland to be closer to her family. Bonnie’s Primary Care provider, Emma McMicken encouraged her to work on getting healthier. Bonnie set a goal, changed her diet and began to swim every day for exercise. Soon after these lifestyle changes, Bonnie’s prescription medication dosages were lowered and some eliminated altogether. Emma’s enthusiasm and caring manner encouraged Bonnie to continue on her health journey. In January of 2016, Bonnie noticed she wasn’t feeling right. No matter how much rest or exercise she got, no matter how well she ate, she just didn’t feel right. Emma ran some tests over the next several months. In April, Bonnie developed a high fever of 104.8. She made an appointment at LVIM and was sent immediately to the emergency room. E-coli from the swimming pool Bonnie had been frequenting had invaded Bonnie’s system causing her veins to collapse and her kidneys to begin shutting down. It took her five weeks to fully recover. As Bonnie started to feel like herself again, results came in from an ultrasound Emma had taken during the battery of tests she ran previously. It showed some small tumors and a biopsy was taken. Emma called Bonnie personally to deliver the hard news that the tumors were positive for cancer. 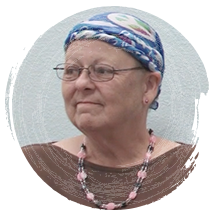 Through LVIM’s Referral Program, Bonnie received full treatment, including major surgery, chemotherapy, and radiation, at no cost to her or LVIM, at Moffitt Cancer Center, one of LVIM’s ancillary partners. Bonnie finished her treatment in January of 2018 and is alive and well. During her time as a patient at LVIM, Bonnie has received the following services from both United Way supported programs – Chronic Disease Management and Pharmacy. In addition to these services, Bonnie has received overall primary care, mammograms, ultrasound, and visits with the dermatologist, podiatrist, optometrist and gynecologist.